17) You think that the only time we should take Christ seriously is when He says,'Verily'. 18) You Think Christ came back when they weren't looking. Though I liked the First Left Behind Movie, mostly the soundtrack, it did leave a lot to be desired. Being left behind comes from Matthew 24 and rather than being a picture of the rapture is a picture of the judgment. It is compared to the flood where the ones 'taken' were the wicked ones, so being left behind during this period (Jacob's Trouble-Jeremiah 30:7) is to be desired. The Ones taken are the ones being judged and the ones 'Left Behind' are the ones spared. But being of the Pretrib persuasion I know that the ones left behind during this period (Matthew 24) will be the ones that were left behind earlier (1 Thessalonians 4:16,17) at the rapture but came to the knowledge of Christ since then. But rather than this being an argument for the timing of the rapture in regards to the Tribulation I want to show how this is a minor point in relation to what Preterism teaches. The following points are expounded on in the messages in the parantheses, that I have already written or will be writing. 10) Preterism has made most of the NT irrelevant for Christians today, including the Lord's Supper-(#4- You think the Epistles and Revelation are only history books. The argument that the pretribber is an escapist won't work because the only way we are going to escape is the same way Noah and Lot escaped and that was with God's help and if He doesn't help us then we stay. I'm sure that if Noah and Lot were as tough as the ones today think they are then they might have tried to weather the judgment with the rest too. Whether in the tribulation or out of it, no mark is going on or in my right hand or forehead. The Preterist has already explained that away as a past event or figurative. Still, You Know You're a Preterist if: You Think the Left Behind Movie was the prequel to Home Alone. Which would probably tell us just how much the Preterist cares to know about the Rapture. Guilt by association is not fallacious, when the folks that a person hangs out with share their views. The same goes for the Preterists' association with Skeptics. Being accused of escapism is nothing new for a Dispie but when Preterists are doing the accusing, this makes it worth commenting on. Hmm, Noah had a holy fear of the judgment to come. The Difference between the Preterist and Christians (pre, mid, post and pan) is that Christians believe in a literal, global and future judgment, the Preterist doesn't. I'm sure that some of the ones that Noah was trying to save were accusing him of Escapism. 'Oh, Come on Noah!, God coming and flooding the earth (local judgment according to the Preterist) Do You think a Loving God would do that? Certainly, if it happens , I'm tough enough to tread water until its over, ha ha ha! And how many years have you been building that Ark and still nothing? God must have already come and we just didn't see it, or it could have been when that little river down by Josephus' place overflowed, Yeah!, that must have been God's flood. C'mon Noah, ever since the beginning, everything continues as it always has! It is interesting that the Preterist has explained away the universal flood as he has the universal judgment by fire. A Preterist, in order to be consistent (though consistently wrong), believes that both judgments by water and by fire must be local not universal. "I was first and still am and old-earth creationist and local-flood adherrent. It was belief in a local flood that brought me to preterism. Tim went the other way. What Nate calls an irresponsible hermeneutic is what brought me to preterism. The language in the flood account seemed global until I compared it to how the same language was used elsewhere in Genesis. After careful comparison, I realized it was local. Because the Preterist has made scripture figurative regarding the End, to be consistent (though consistently wrong) He must now make the Beginning figurative as well. The typical Preterist doesn't believe that God created the Earth in Six Literal Days. The Preterist joins and in fact helps the Evolutionist with his arguments that the earth is millions of Years old. Yes, Preterists are guilty by their associations. I am convinced this is precisely the point where covenant thinking and ultimately preterism offer a tremendous gift in God’s Providence to the progress of the Genesis origins discussion in the modern Church. ...But geological science, like heliocentrism, threatens the Biblical Faith only if we read the language of Genesis in a scientific-literal way." This Preterist quotes an atheist (Bernard Ramm) and then joins evolutionists in declaring the Six Days of Creation figurative. He continues to quote this atheist regarding whether we should take the Bible literally or not, then argues against a universal flood. Now if you didn't already get the preposterous but revealing nature of this Preterists statement and associations, let me summarize. This Preterist is quoting an atheist to argue for Christians to not take the Bible literally. Guilt by association and agreement. You see the Evolutionist needs millions of Years not six literal days to allow the evolutionary process to create what we have today, without God. Why would any real Christian want to join him on this? Now if God wants the Israelites to observe a literal six day work week and rest on a literal seventh day because/For that is How long He took to create the world, and then rest, then the days of Creation have to be literal as well. Today, we have scoffers and some of them are called Preterists. 'Oh, Come on Dispie!, God coming and judging the earth (local judgment according to the Preterist) Do You think a Loving God would do that? Certainly, if it happens , I'm tough enough to endure until its over, ha ha ha! And how many years have you been making this claim and still nothing? He must have already come and we didn't see it, or it could have been when that little town called Jerusalem got ransaked in AD 70. Yeah!, that must have been God's complete judgment. C'mon BJ, ever since the beginning everything continues as it always has! 9 The Lord is not slow in keeping his promise, as some understand slowness. He is patient with you, not wanting anyone to perish, but everyone to come to repentance. 10 But the day of the Lord will come like a thief. The heavens will disappear with a roar; the elements will be destroyed by fire, and the earth and everything in it will be laid bare. The coming global and literal judgment ought to spur us on to Holy Living. If we have explained it away then we have subverted God's word and taken away one of the incentives for Holy Living. Nine people lifted up their eyes in hell. The first person said, What is this!, Doesn't the Bible say, Repent and be Baptists? Another exclaimed, "This is not literal"
The next person said, "Relax, this already happened in 70 A.D."
Another screamed, 'Someone is praying me out of here'. While another complained, Where are the virgins that were promised to me? Gee, I just dunno how God the Son could possibly get our attention when He comes. He pretty much showed us the best and worst in AD 70 and all the rest would be anticlimactic and uneventful, incapable of getting the worlds attention. Now how can He show himself to every inhabitant of Planet Earth simultaneously. If we can be notified of impending Tornadoes, Hurricanes etc. I'm sure we will be able to see Him. "The United Kingdom-based Daystar International Ministries installed MessiahCAM, a web-linked camera aimed at Ascension Chapel on the Mount of Olives in Jerusalem, to record the return of Jesus Christ. 'Enjoy the view and meditate on it...in anticipation of the soon coming of the Lord,' visitors to the site are told." Webcam of the Mount of Olives, sometimes works sometimes doesn't. I'm sure God can ensure that it will be properly working at the right time, if that is how He plans on communicating His coming. Here is a view of Jerusalem and I believe the Dome of the Rock from the Mount of Olives. I'm sure that it is plausible that the splitting of the Mount of Olives when Christ touches down could cause an earthquake that will level the Dome of the Rock or that could come when the two witnesses are resurrected then raptured. 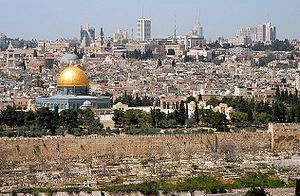 Jerusalem is the city of Three World Religions. If You don't think that splitting the Mount of Olives and Levelling the Dome of the Rock won't get immediate attention then I cannot help you. Here is a picture of the Western Wall with the Dome of the Rock/Islam Behind it. Watch the two Webcams mentioned above because both will be affected when Christ comes back. Possibly when He splits the Mount of Olives at His coming, it could cause an earthquake at the Dome of the Rock. You can find all kinds of information about Walmart Here. This is just one of the perks of the Preterist New Heavens and Earth. A Still picture will do because its exterior pretty much remains the same. I'm sure that when Christ does actually come back, the Preterist will actually dismiss it as an elaborate Hollywood Publicity Stunt, trick photography or something, even if that Preterist delusion only lasts for a few moments. 13) You Think that R.C. Sproul and Hank Hannegraff are a few of the early Church Fathers. Certainly, the Bible doesn't support the Preterist view, unless you make interpretation a mostly figurative exercise. Now nothing is wrong with reading commentaries on a subject and to examine how particular authors view scriptural events. 2) Figurative translation which modifies the plain sense of scripture to fit the Preterist assumptions. 3) Also the idea that it is their way or the highway. If they can show that something happened in 70 AD then most everything happened in 70 AD. David Reagan (not a Preterist) says, "I think that's the way these schools of interpretation relate to each other. Each one of the four contains an element of truth. The problem comes when you accept only one and reject all the others. We must never forget that the book of Revelation contained a very relevant message to First Century Christians. It assured them of their ultimate victory over the Roman Empire. We must also remember that the book has been given relevant application to the struggles of the Church throughout history." I emphasize this because I have heard Preterists act like they are the open minded enlightened folks when nothing could be further from the truth. Preterism seems to be a relatively new idea and that wouldn't be so bad if one could show that the time calls for their understanding of scripture. Regarding Dispensationalism and the belief that Israel has been temporarily blinded, while the fulness of the Gentiles are come in (Luke 21:20-24; Romans 11:24-27) could be experiencing more exposure and revelation because the time of the Gentiles may be near and it has become imperative that folks understand that the Nation of Israel is and will be experiencing a continuation and conclusion of what God has promised them, soon. In regards to Dispensationalism just like Preterism there are differing degrees. I began my dispensational journey by reading Cornelius Stam who wrote 'Things That Differ' over twenty five years ago. A Bible College Student invited me over to his house where he and his friend talked to me about Dispensationalism. After they thoroughly confused me they gave me the book by Stam. I read it several times, then put it down for about fifteen years and then examined scriptures to see if what the author said was true. I came to accept much of what he said, but rejected some things as well. My conclusions led me to believe in the distinction between Prophecy/Israel and the Body of Christ and the Mysteries. I never accepted Dispensationalism as an overall system but as a hermeneutic that can help me understand scripture. I don't make a complete distinction between one dispensation and another and see this present dispensation as inclusive (Acts 20:25-28) not completely exclusive of the previous dispensation. I believe in Christian circles Water Baptism and the Spiritual Gifts are still relevant today. So I give much credit to Stam for his understanding of the Dispensations, I differ with him in some areas. Everyone should honestly put aside their commentaries for a while and look at the whole of scripture to see if all the scriptures support what men are saying. Preterists ought to do the same. If they don't then they run the risk of falling under the condemnation of the apostle Paul. "What I mean is this: One of you says, "I follow Paul"; another, "I follow Apollos"; another, "I follow Cephas"; still another, "I follow Christ." 13 Is Christ divided? Was Paul crucified for you? Were you baptized into the name of Paul? Here Paul is warning against following him or Peter or anyone other than Christ. He even avoided baptizing so that they wouldn't follow him. What, one may ask is wrong with following any of these men of God? 2) Anytime one follows the words of one of these without including the words of the rest of God's men, then they run the risk of seeing one side without the other. This is why denominations such as 'Methodist', 'Lutheran', are actually following particular men of God, and just because some of these denominations don't name their clique after a man of God doesn't mean that they aren't following one. Cliques and Group Think are the result of such actions and Paul condemns it. "We need strong leaders in churches and throughout the brotherhood who take a firm stand and boldly challenge all (not just the party's declared object of attack) false doctrine. I also know that one can be used as a party leader without their endorsement (I Cor. 1, 3). Friendships, family, and school affiliation must not be allowed to dictate our stands, beliefs, and loyalties. Schools, magazines, and influential brethren must constantly guard against becoming a party source. Brethren need to become more independent of style and position deciding influences among us. We must look to Jesus, not a party or any man (Jn. 8: 24, Heb. 12: 2). There also desperately needs to be more plain teaching on the subject of the party spirit, identifying, exposing, and challenging it." Irving Janis formulated eight guidelines to determine whether a particular group of folks are falling into the trap of Group Think. Catholics Rob Paul to Pay Peter. Paul (not the twelfth or thirteenth apostle) did claim that he had the 'whole counsel of God' ,which included the 'Kingdom' which was Christ and Peter taught. Many Dispies reject this fact. If one only followed the words of PReter, I mean PReterism this would be in effect cookie cutter eschatology that refuses to deal with the leftover dough/scripture that would reveal the shortcomings of this system of thought. along with other rules such as, 'The Bible interprets itself', 'If the plain sense makes sense, seek no other sense to replace it, lest you end up with nonsense". Now one area where I modified a rule is regarding the plain sense. Dispies don't include 'to replace it' in their formula, while I do, because it is all right to see a spiritual or allegorical interpretation to a passage just as long as it doesn't 'replace' or contradict the 'plain sense', literal interpretation. I have included that addition for quite a while now. Paul/New World Dawning recently brought to my attention something called 'P'shat' which is very similar to the plain sense rule, but also includes the possibility of more than one interpretation to a passage. This confirmed my addition to the Plain Sense Rule. The Preterist has determined that, If the plain sense makes sense, seek ANOTHER sense, lest you rightly dispense. "The problem comes when you accept only one and reject all the others." He is warning all schools of thought to avoid arrogant Group Think that assumes your view is the whole picture. I believe that Luke 21:20-24 was fulfilled in 70 Ad and was a continuing thing clear up to the Holocaust and continuing on to the Fulness of the Gentiles. One of the many differences between the Preterist and I is that I know that it all didn't end there and I don't need this extrabilical event to believe what I do. Does this mean that Israel won't experience the same kind of things in the future as well. Of Course Not!! I will be putting all these messages under my 'You Know You're a Preterist if:' Points at my site. All one has to do is to click a particular point and it will take you further down to the message that defends the point. When it is completed I will provide the Link. If the Preterist prefers that i say 'Millenium' rather than 'New Heavens and Earth' I can oblige them. The fact of the matter is that God doesn't guide those that think that their intelligence or Reading comprehension gains them a better understanding of bible truth. There is a difference between one intellectual capacity and their spiritual receptivity. This is why Retarded people can understand God's truth if their willing. Faith cometh by 'hearing', the word of God. They are not condemned if they cannot read it from a faulty Preterist angle. God guides those that have the Holy Spirit not Sproul guiding them. But of course if one refuses to recognize that the Holy Spirit is a person, they might have to deal with that first. The Greek Word for 'word' here is logos and we get the english word, 'logic' from it. No, but it shows that He who was with God and was God, is the starting point for any true reason and logic. One can think everyone else has the problem but their logic is flawed if they have made some wrong first assumptions. One can be utterly brilliant in their logic, but if it is based on faulty first assumptions, their brilliant logic will only lead to wrong conclusions. This is why we have brilliant Theologians on all sides of every religious question. John One says that the 'darkness comprehended him not' which is the KJV. Other translations say 'overcame it not' So which is it? It is both. The Darkness overcame and understood Him not. One that will not believe who Christ is and the Nature of the Triune God cannot presume to know the lesser things. One has to be willing before they are able, when it comes to spiritual things. This is why Paul, though a brilliant man, knew how truth comes. So does Preterism make some faulty first assumptions? They have assumed that some prophecies fulfilled means all prophecies fulfilled. They have assumed that 70 Ad was when all the prophecies were fulfilled, though there is no evidence whatsoever for that assumption. They have assumed that when the bible says, 'This same Jesus, who has been taken from you into heaven, will come back in the same way you have seen him go into heaven." (Acts 1:11), it can really mean, 'in a different manner '. All their brilliant logic after these faulty first assumptions will not matter and will in fact lead them down the wrong path. 15) You thought the Catholic/Peterist Luis de Alcasar was forming an entirely new movement called Preterism when making his anti-reformation argument. 16) You actually think things are getting better and that the new Super Walmart in your neighborhood is one of the perks of the New Millenium. Futurist Christians of all eschatological stripes take Christ's words seriously including the words of his apostles. What part of 'Until the time of the Gentiles are fulfilled' does the Preterist not take seriously? Both verses plainly involve a time element. I believe that this could have begun in AD 70 but 'Until' means a time period beginning with, 'a hardening in part' and 'will be trampled on' . If this time period began in 70 AD we have to conclude that it ends sometime after 70 Ad, so for this passage 70 AD is only the beginning. The Full Preterist makes no provision for 70 Ad only being the beginning, which would have to include the Holocaust because for all the prophecies to be fulfilled we would have to include, 'For then there will be great distress, unequaled from the beginning of the world until now--and never to be equaled again.' (Matthew 24:21) , which certainly couldn't be restricted to 70 AD. Futurists do take the time elements of scripture seriously. They also take Christ seriously in everything else he says unless they are Liberals, and if they are liberals they are not Christians. Liberalism is more a byproduct of Preterism than it is of futurism. "I do not believe you fight liberalism with liberalism. Dr. Sproul believes that he is defending the integrity of Scripture by adopting the preterist interpretation. However, in reality, I believe that he is adopting a naturalistic interpretation that too many liberals feel at home with. While Dr. Sproul sees Matthew 24 as a prophecy that was fulfilled in the first century, liberal preterists joins him in giving a naturalistic explanation even though from a different framework. But they both deny that our Lord prophesied a supernatural, bodily, visible return of Christ in fulfillment of Matthew 24." "On the other hand, Dr. Sproul and other preterists would not have a supposed problem that they and liberals seem to think they have if they adopted the approach of dispensationalism which distinguishes between the rapture that could take place without warning at any moment and the second coming which will be preceded by the signs of Matthew 24. True, many of the post-Apostolic fathers believed that Jesus would come back soon, but the New Testament teaches that Christ's coming in the clouds to rapture His church is imminent (1 Cor. 1:7; Phil. 3:20; 1 Thess. 1:10; Titus 2:13; Heb. 9:28; 1 Pet. 1:13; Jude 21; cf. Matt. 24:45-47; Mk. 13:33-37; Lk. 12:35-40), an event that could have taken place at any time during the last 2,000 years. Thus, Scripture does not need to be rescued from the higher critics by adopting the preterist interpretation." This is why Dispensationalism is the best but certainly not the only view that is capable of refuting Preterism. Still, I am not saying that Preterists should have taught the rapture rather than the second coming in 70 AD or that the rapture occurs before the Tribulation begins but simply a difference between the rapture and the second coming. I think both pre and posttribbers can agree that these are not the same event. Simply said, Israel's rejection of Messiah is part of the reason for the two comings of Christ-separated by the delay (Romans 11:24-27) and the two aspects to the Second Coming of Christ-separated by a delay. The Length of the delay between the two aspects are partly dependent on Israel's response, though God in his foreknowledge knows just how they will respond. This also shows us the dichotomy between the sovereignty of God and the responsibility of man. I personally believe that had Israel received Messiah, there would not have been two comings or two aspects to His coming separated by years and that the Gentiles would have been blessed through Israel's acceptance of Messiah rather than their rejection of Messiah. This is why the OT prophecies regarding his comings can be see as one, (Zechariah 9:9,10; Isaiah 9:6,7; Isaiah 61:1,2) and NT prophecies concerning the Rapture and the Second Coming can be seen as one not but not the same. It is all dependent on Israel's response to their King. Instead of putting the time delay on the head of unbelieving Israel, the Preterist seeks to placate the Jewish Skeptics with an eschatology that teaches that Christ came but only when they weren't looking. As a result the Preterist creates a Jesus that underwhelms and provides liberals and skeptics with another argument aimed at the Preterist's Jesus' lack of power. All this could be resolved if the Preterist only took Christ seriously when He promised something rather than backpedaling and excusing Jesus with impotent and watered down reinterpretations. The Preterist does not believe in a delay, so must explain away the plain sense meaning of what Christ and the apostle Paul said. I guess i just believe that Christ, the apostles and angels meant what they said and I wouldn't need a Preterist Instant Redefinition Chart to help me know what they really meant. If the words 'same' in this passage really means different, then how are we to stop anyone from claiming that he or she is the second coming of Christ? Sun Myung Moon claimed this. If 'this same Jesus' is not coming back in the 'same way you have seen him go' then how can we know that Sun Myung Moon coming from Korea on a boat isn't Him? To be consistent shouldn't I believe that Christ figuratively left a figurative mountain called the mount of Olives to return to that same figurative mountain? And if he figuratively left did He really leave at all? If you want to say that 'same manner' means 'different manner' then we need to determine when we are supposed to believe that Christ means what He says. Resurrection always includes the physical and our resurrection is tied in with His, which was demonstrated to be physical. Some get confused when they hear that we will have spiritual bodies and think this means a spirit. The Jehovah's Witnesses do this. JW's also argue that 'Flesh and Blood cannot inherit the kingdom of God.' so therefore resurrection has to be of the spirit. What JW's overlook was that Jesus said, 'A Spirit does not have flesh and bone as you see me have'. He didn't say He was Flesh and Blood after the resurrection even though we know that Jesus blood was pure. For us however, corruption is in the blood not in flesh and bones. Our bodies of flesh and bone will be glorified as well, meaning that there will be no dependence on blood not even in the bone marrow. The Full Preterist believes Jesus rose physically but we won't. All I can figure is that this is the eeny meeny miny mo method of deciding what should be literal and what shouldn't be. The Preterist is Presumptuous by supporting his Preconceived Notions of Prophecy with Preposterous Presuppositions. "Proponents of Full Preterism do not believe in the bodily Resurrection of the dead and place this event as well as a spiritualised understanding of the second coming in 70 AD whereas proponents of Partial Preterism do believe in a bodily resurrection of the dead at a future second coming . Preterists also believe the term 'Last Days ' or 'End Times ' refers not to the last days of planet Earth, or last days of mankind, but to the last days of the Old Covenant, the Mosaic Covenant which God had exclusively with Israel until year 70 AD. " It sure looks like Jesus saw things as including the physical, why shouldn't we? The Full Preterist sounds more like the gnostics regarding the Coming of Jesus, and the resurrection of the dead. If 'every eye shall see him' doesn't mean every physical eye then what kind of eye are we talking about? If it was only every spritual eye then why is the whole world, including unbelievers going to see him. It is really hard to comprehend how anyone could believe this nonsense. The Preterist wants us to believe Christ was literally and physically 'pierced', that He is literally the 'Lord God', as this passage says but that 'every eye will see him' with a spiritual or figurative eye. They want us to take scripture literally and physically when they say so and not when they say not to. "If all the language of Scripture pertaining to the Second Coming of Christ is not to be taken historically and in a normal sense, then why not take the virgin birth of Christ, for example, or other miracles in a "spiritualized" way, as the Preterists do in reference to prophecy? Preterism opens the door for similar liberal departure. Actually, in Revelation there is a clear difference between the Seals and the Mark mentioned. I actually put together a chart which shows the difference. I'm not trying to prove that the mark is a microchip on or in the hand or forehead, only that it is physical, literal and in the future. A microchip could very well be how it is accomplished. It seems that Walmart is already placing these chips in their products. "Now America's Super Store WALMART is using a small radio transmitter embedded within the packaging of products on their store shelves, and they claim it cannot be tracked outside their store. Well I beg to differ on that Mr. Walton. IBM is currently running TV ads that clearly show that radio tags, or RFID as it is known, can help lost truckers on the highways, the ad shows a lost pair of truckers hauling products through the desert, they slam on the breaks because a woman is sitting in a desk in the middle of the road, they ask, WHAT ARE YOU DOIN OUT HERE? She replies, "the packages in your truck told us you were lost, I am here to get you back on the right path" and the commercial ends. Wal-Mart tells us the RFID tags in the products can't be tracked outside the store but IBM tells us they can track RFID tagged products in the middle of the DESERT!?!" The commercial ends with one guy saying to the other trucker that maybe you ought to let them drive. Preterists will be joining all the others in saying that the mark in or on the hand or forehead is for your shopping convenience because according to the Preterist, the Mark of the Beast mentioned in scripture was figurative and in the past. The Preterist feels quite comfortable with believing that the Mark is figurative and a thing of the past. This is why the Preterist may even lead the Pack in accepting the Mark of the Beast and in addition to this may even think this is one of those perks in the New Heavens and Earth along with the New Walmart that was just built. Pretty soon these chips could tell people where to go, how to get there and humans won't even be able to think for themselves. Have you ever seen people with cell phones and how brain dead and possessed they look while they are simultaneously doing something else like driving etc. I have shown what Preterists believe by quoting Preterists and from Preterist websites.